This was a real winner with the family. Everyone liked it and it was quick to get on the table, which gives it even more appeal for the “mom” in me. Heat a large skillet over medium heat and brown hamburger with garlic in the sesame oil. Drain most of the fat and add brown sugar, soy sauce, ginger, salt, pepper and crushed red peppers. Simmer for a few minutes to blend the flavors. 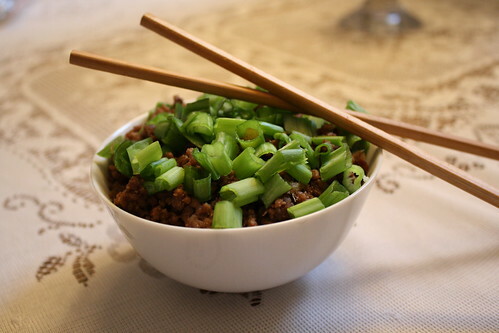 Serve over steamed rice and top with green onions. Optional: Hubby wanted his meat cooked with an egg so I cracked an egg into the meat mixture and stirred it until it was cooked. Also could poach an egg and put it on top. I think next time I will try poaching eggs. Posted on July 28, 2012 by cookingwithpizazzPosted in Beef, Main DishesTagged Beef, Food, Main Dish, Oriental, Recipe.